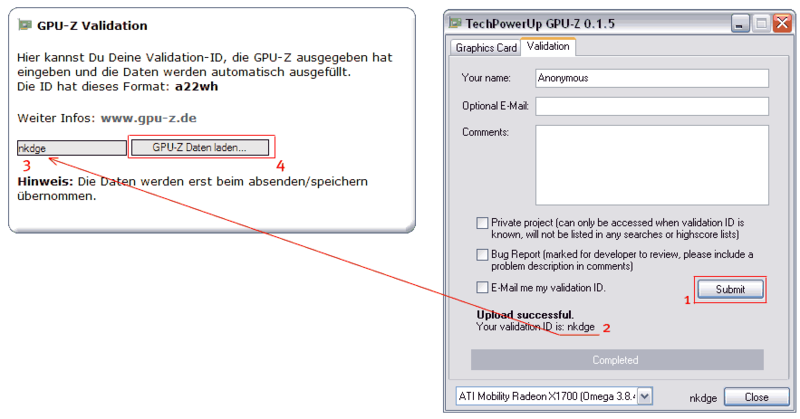 GPU-Z ist ein praktisches Diagnoseprogramm (Freeware) von techpowerup.com, welches detaillierte Informationen über die Grafikkarte des Rechners aufzeigt (ähnlich wie CPU-Z für Prozessoren). Es stehen u. A. detaillierte Informationen zu Chipsatz, Speichergröße/-typ, DirectX-Version, Takt, Treiberversion etc. zur Verfügung. „GPU-Z Daten laden...“(4). Profil absenden - FERTIG! - Bus interface for Fusion and Intel SB/IB will now be "N/A"
- Fixed bug that caused updater to show up even though no update available, lagging GPU-Z. - Added startup parameter /card followed by the adapter index, starts with 1. - Complete revamp of voltage controller architecture. 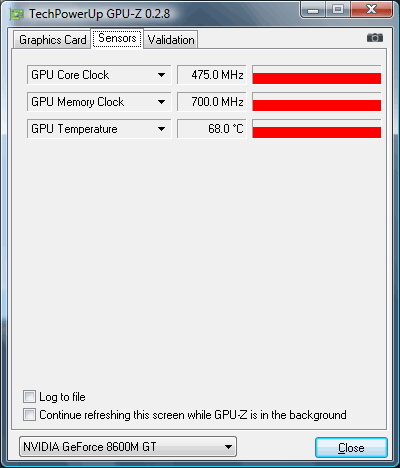 Adds voltage monitoring for many ATI & NVIDIA cards and generic monitoring method for NVIDIA cards via driver. - Added OCP adjustment for CHL8266 (GTX 480). Use it via command line parameter /chl8266ocp without parameter to query, with numeric value seperated by space to set. This is a permanent change that will not be reverted by powering down the system. - Fixed an issue on all NVIDIA cards that would sometimes cause them to lose fan control when GPU-Z is running. Please don't run pre-0.4.2 and 0.4.2 at the same time, this might result in incorrect readings in the 0.4.2 window. - Reverted memory bandwidth calculation introduced in last version. It introduces too much confusion, we will go with what all companies use in their marketing material, even though we believe it is not correct. Using power of 10 again now, 1 GB/s = 1,000,000,000 Bytes per Second. - Added localized tooltips in the languages: AM, AR, BG, CN, DE, FA, FR, IT, PT, RS, RU, TR, UA. Default language is your system language, you can change this setting in the system menu of GPU-Z. 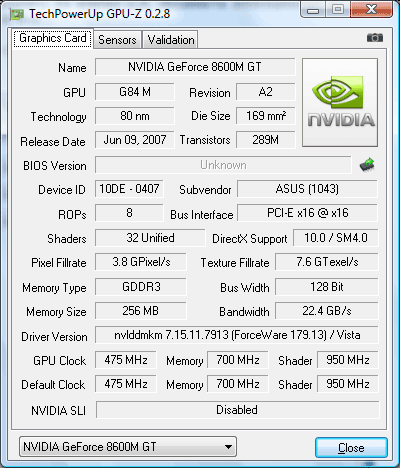 - Added support for NVIDIA GeForce 6200A, GTS 250, 9800S, 205, 310, GT 320, GT 240, GTS 360M, 230M, 330M, 240M, G105M, Quadro NVS170M, G210M, GTS 250M, future MCP, more ION variants. - Added detection for variants of NVIDIA NV41, G94, G98, ATI RV350, RV370, R480, RV515. Most of them used on fake cards relabeled to NVIDIA 9x00 series. - Added framework for translations in GPU-Z, to do that we need your help. - Voltage controller "slaves" are now called "phases"
- Added display for GPU release date. The data is incomplete, if you have more info please post in the - sticky thread in the support forums. - CrossFire on Vista64 now reported with note "unsure", instead of just "unknown"
- Fixed Vista32 / Vista64 detection. It was reversed in 0.2.0. - Process size, Die size, DirectX Support will now show "Unknown"
- When submitting a bug report, a problem description is required.